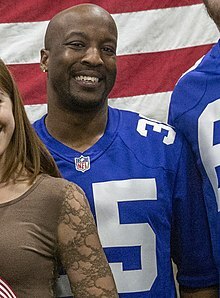 Curtis Kaazim Riley Jr. (born July 18, 1992) is an American football cornerback for the Oakland Raiders of the National Football League (NFL). He played college football at Fresno State. Riley went undrafted in the 2015 NFL Draft. On May 4, 2015, the Tennessee Titans signed Riley to a three-year, $1.58 million contract that includes a signing bonus of $12,000. Throughout training camp, Riley competed for a roster spot as a backup cornerback and special teams player against Khalid Wooten, Marqueston Huff, Cody Riggs, Jemea Thomas, and Ri'Shard Anderson. On August 10, 2015, the Tennessee Titans waived Riley after he injured his ankle while making an interception during practice. He reverted to injured reserve after clearing waivers. On November 3, 2015, the Tennessee Titans fired head coach Ken Whisenhunt after they fell to a 1–6 record and promoted assistant head coach/tight ends coach Mike Mularkey to interim head coach for the remainder of the season. Riley entered training camp as a backup cornerback and competed for a roster spot against B. W. Webb, Valentino Blake, Kalan Reed, Bennett Okotcha, Cody Riggs, and Josh Aubrey. On September 2, 2016, the Tennessee Titans officially waived Riley as part of their final roster cuts, but signed him to their practice squad the following day. On September 22, 2016, the Tennessee Titans promoted Riley to their active roster. On October 9, 2016, Riley made his professional regular season debut in the Tennessee Titans' 30–17 victory at the Miami Dolphins in Week 3. Riley was inactive as a healthy scratch for eight of the next 11 games (Weeks 6–7, 10–11, and 14–17). Riley competed for a roster spot as a backup safety against Brynden Trawick, Da'Norris Searcy, and Denzel Johnson. Head coach Mike Mularkey named Riley the backup free safety to start the season, behind Kevin Byard. Riley was inactive for the Tennessee Titans' season-opening loss to the Oakland Raiders. On September 17, 2017, Riley made one solo tackle, broke up a pass, and made his first career interception off a pass by quarterback Blake Bortles in the second half of a 37–16 victory at the Jacksonville Jaguars in Week 2. The interception helped set up the Titans on an eventual field goal scoring drive to close out the first half. In Week 4, he collected a season-high four solo tackles during a 57–14 loss at the Houston Texans. Riley was inactive for eight of the next nine games (Week 9–15). He finished the season with 12 combined tackles (eight solo), two pass deflections, and one interception in four games and zero starts. On March 16, 2018, the New York Giants signed Riley to a one-year, $630,000 contract. Riley was reunited with New York Giants' assistant defensive backs coach Deshea Townsend who had previously held the same position with the Tennessee Titans. Riley started training camp as a cornerback and competed against Donte Deayon for a roster spot as the first-team nickelback, but was moved to safety after Darian Thompson suffered a hamstring injury. He competed to be the starting free safety against Darian Thompson, Andrew Adams, Michael Thomas, and William Gay. Head coach Pat Shurmur named Riley the starting free safety to begin the regular season. He started alongside strong safety Landon Collins and cornerbacks Janoris Jenkins and Eli Apple. He made his first career start in the New York Giants' season-opener against the Jacksonville Jaguars and recorded six combined tackles in their 20–15 loss. On October 7, 2018, Riley recorded three solo tackles, deflected a pass, and intercepted a pass by quarterback Cam Newton during a 33–31 loss at the Carolina Panthers in Week 5. On December 9 against the Washington Redskins, he scored his first NFL touchdown after intercepting a pass from Mark Sanchez. On March 22, 2019, Riley signed with the Oakland Raiders. ^ "Bio for Curtis Riley". titansonline.com. Retrieved May 13, 2016. ^ "Curtis Riley, DS #39 CB, Fresno State". DraftScout.com. Retrieved October 16, 2018. ^ "Titans Agree to Terms with 14 Undrafted Free Agents". TitansOnline.com. May 11, 2015. Retrieved July 15, 2017. ^ "Spotrac.com: Curtis Riley contract". Spotrac.com. Retrieved October 16, 2018. ^ "Perrish Cox should improve Titans' cornerback play". tennessean.com. July 27, 2015. Retrieved October 16, 2018. ^ McCormick, Terry (August 10, 2015). "Titans activate nose tackle Hill off PUP; waive/injured CB Riley". 247Sports.com. Retrieved October 16, 2018. ^ "Titans fire coach Ken Whisenhunt". ESPN.com. November 4, 2015. Retrieved October 16, 2018. ^ "Ourlads.com: Tennessee Titans Depth Chart: 07/01/2016". Ourlads.com. Retrieved October 16, 2018. ^ Wyatt, Jim (September 2, 2016). "Titans Down to 53 Players: A Position-by-Position Look". TitansOnline.com. Archived from the original on August 7, 2017. ^ Wyatt, Jim (September 4, 2016). "Titans Sign Nine Players to Practice Squad". TitansOnline.com. Archived from the original on August 16, 2017. ^ Wyatt, Jim (September 22, 2016). "Titans Promote CB Curtis Riley to Active Roster". TitansOnline.com. ^ "NFL Player stats: Curtis Riley (2016)". NFL.com. Retrieved October 16, 2018. ^ "Titans release unofficial depth chart". tennessean.com. August 7, 2017. Retrieved October 16, 2018. ^ "Ourlads.com: Tennessee Titans Depth Chart: 10/01/2017". Ourlads.com. Retrieved October 16, 2018. ^ "Tennessee Titans at Jacksonville Jaguars - September 17th, 2017". Pro-Football-Reference.com. Retrieved October 18, 2017. ^ "NFL Player stats: Curtis Riley (2017)". NFL.com. Retrieved October 16, 2018. ^ "NFL Player stats: Curtis Riley (career)". NFL.com. Retrieved October 17, 2018. ^ Eisen, Michael (March 16, 2018). "New York Giants sign G Patrick Omameh, DB Curtis Riley". Giants.com. ^ "How Giants' free safety position battle got turned upside down in preseason". nj.com. August 26, 2018. Retrieved October 17, 2018. ^ Fennelly, John (September 5, 2018). "Giants release regular season depth chart: Instant analysis". giantswire.usatoday.com. Retrieved October 17, 2018. ^ "NFL Player stats: Curtis Riley (2018)". NFL.com. Retrieved October 17, 2018. ^ "Raiders sign S Curtis Riley". Raiders.com. March 22, 2019. This biographical article relating to an American football defensive back born in the 1990s is a stub. You can help Wikipedia by expanding it. This page was last edited on 5 April 2019, at 07:52 (UTC).